The Holidays are fast approaching, and what better gift for friends, co-workers, teachers, or family than a unique, handmade gift? In this workshop you will design and make up to 8 pairs of earrings (time allowing). That’s 8 beautiful, elegant, sporty, casual, fashionable handcrafted gifts… or keep them all for yourself! 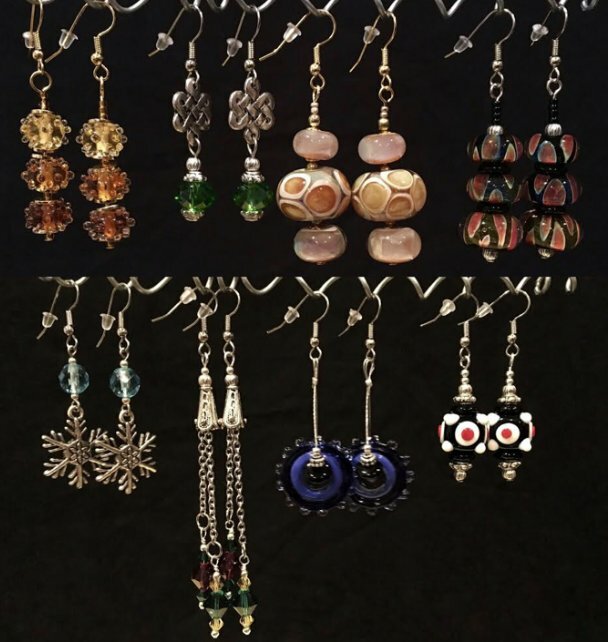 You could easily spend the price of this class on one pair of earrings in a boutique, and after this class you will have learned the skills to make as many earrings as your heart desires – make earrings to match all of your favorite outfits! Cost for this class is $20, plus materials & $12 “findings” kit (kit includes ear wires, headpins, eye pins, and 20 spacer beads – enough for 8 pairs of earrings. Main focal beads are NOT included in the kit, and will need to be provided additionally). Minimum 4 students, maximum 10 students. If the minimum number of students are not registered 48 hours prior to class, the class will be cancelled and a refund issued. Online ticket sales will end 48 hours prior to event. If ticket sales have ended, you may call the store to inquire about availability. – An assortment of your favorite beads to be used as the main focal point of the earrings (enough to make 8 pairs of earrings). – $12 for “findings” kit to complete your project (paid to instructor). – Jewelry making pliers – if you have them. The instructor will have a limited number to be shared. – Optional – A smartphone to take video of technique as you learn.